Exactly two weeks ago I made another cider. Yeah, I know I’ve been complaining that I haven’t done a beer for a while and then I go make a cider! This was a little experiment in keeping something cool enough over summer months. While it hasn’t really been that hot, or even warm, things have gone well. The cider itself is a real basic one. One litre of apple juice and 1.4 litres of apple & pear juice. Added in sugar, yeast and yeast nutrient. Whole thing done in about 10-15 mins. 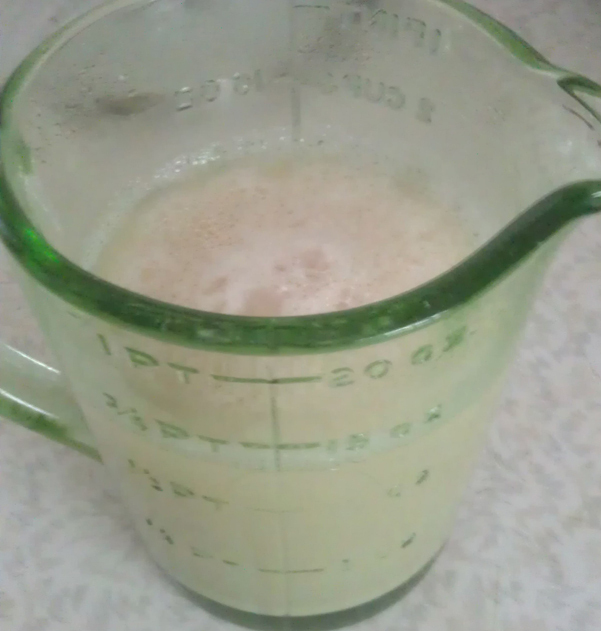 To speed up the process I used the blender to mix sugar into juice, one litre at a time. As there’s no boil everything has to be sanitised, including the blender. What’s in Sneaky Cider #1? Learning from the mistakes of the last cider attempt, I kept sugar levels low. Worked out being only 20 grams per litre rather than the 120 grams per litre or 200 grams per litre of the last attempts. This should help in two ways. First it will keep the alcohol levels down to something considered normal. Second there shouldn’t be anywhere near as much left over sugar which will keep the sweetness down. It’s the second if theses that I’m really interested in. Last time it was undrinkable when first sampled. Then only just drinkable when it was done, but not for everyone. 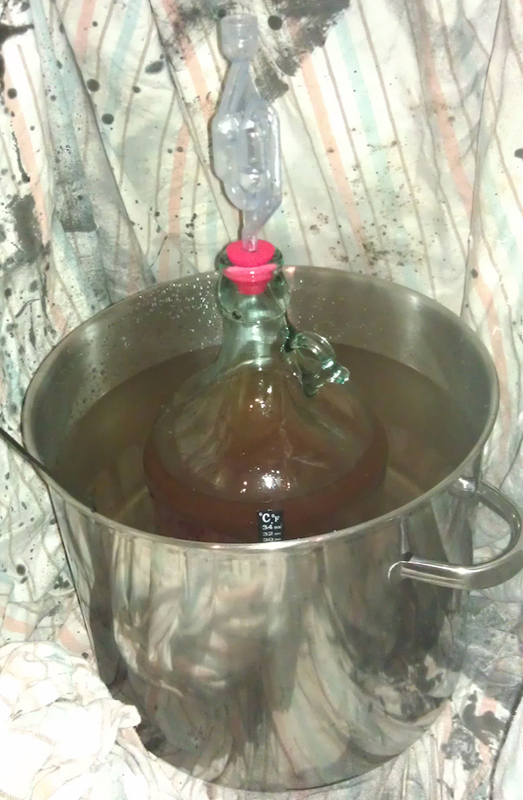 The really exciting part of the cider isn’t the recipe or how it might turn out. No, the real thing is the makeshift cooling set up. 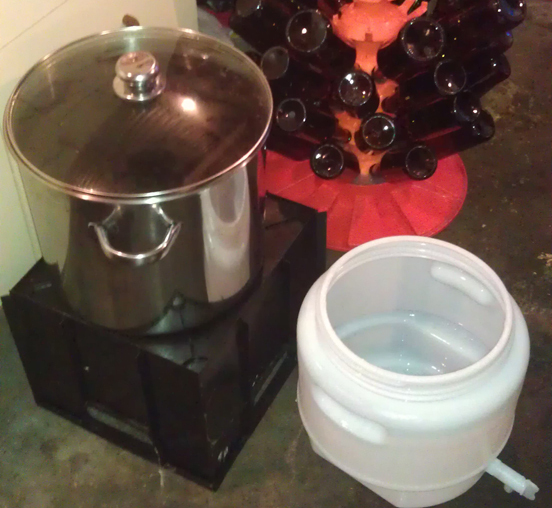 I’ve got my new big pot with water then put the carboy into it. 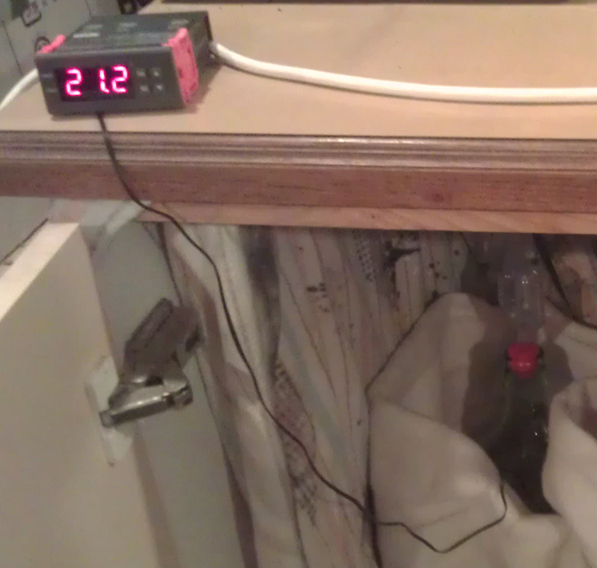 The water goes up to about the same hight as the liquid in the carboy which means it works as insulation. That’s pretty sweet. But the best part is that I can drop ice packs into the water to chill the water back down, like during the day. And that’s what I did. For about a week and a bit I dropped 2-4 ice packs into the water every day. Well, nearly every day. The result was that the temperature ranged from about 17 degrees Celsius up to about 19 degrees Celsius. Not great control but, still good. 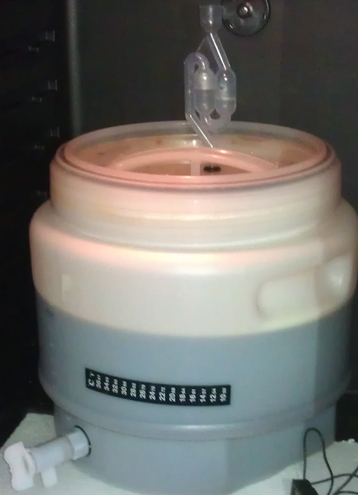 Now just gone two weeks I’m leaving the whole thing to do it’s thing before bottling this weekend. I’m half hoping as it gets warmer it encourages the last of the yeast to kick in or drop out. 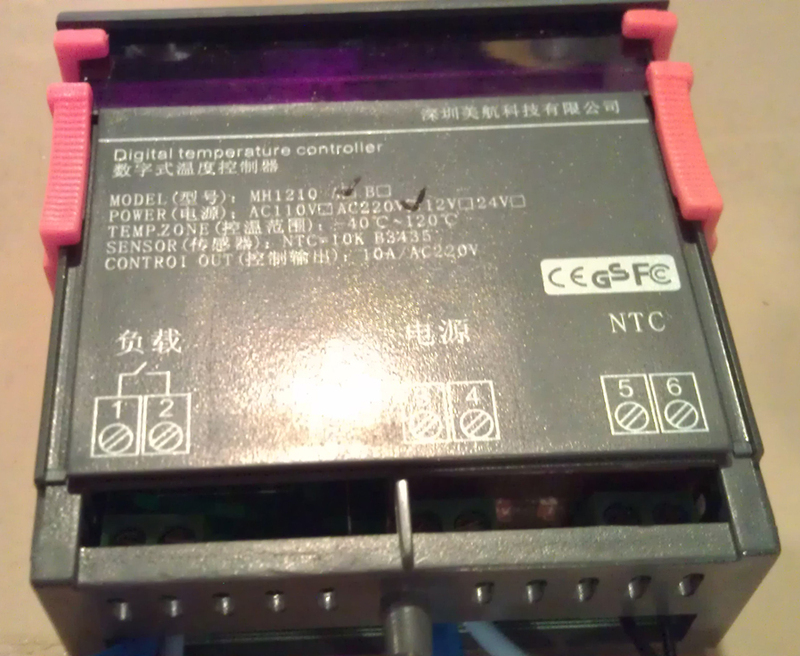 Not really sure how that stuff works, even after over a year of mucking around with the stuff. Then I’ll give it two weeks before we try and let you know how it turns out. Saturday brew day was a long one, nearly 5 hours. I wanted to have another crack at the Baltic Porter. Chas wasn’t available so my mate Kilan came over to give me a hand. 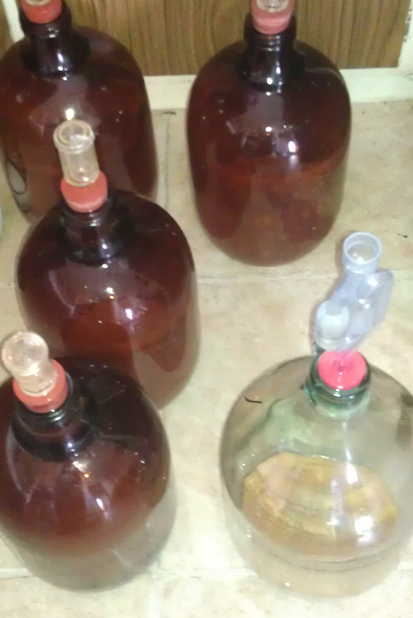 Kilan has done a bit of home brewing over the last few years. Most of his equipment is in storage. He’s still been able to make some cider and brought over a bottle to share. Will talk about that later. Was fun to have Kilan over for the arvo. We worked on a few things that neither of us had done before. 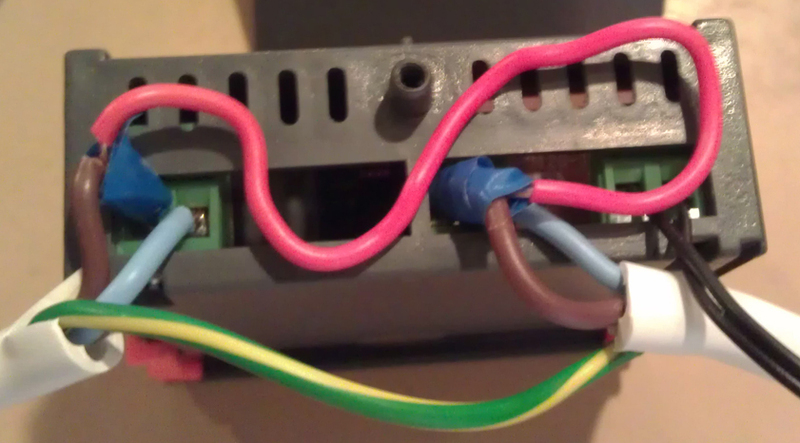 Had a couple near misses and a whole heap of improvisation. 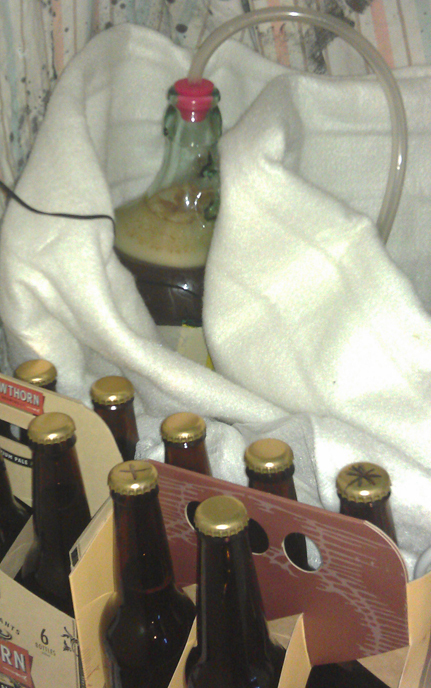 By the end of the day we had bottled the Hoppy Heart IPA and brewed what we felt would be a really good beer. The last time I did the Baltic Porter it was a 10 litre batch. The beer came out nice enough but lacked some body. The beer had a little too much sweetness. There was room to adds more complexity. In short, there was a lot that could be tweaked. Given the relative ease of the full grain mash at Chas’s last week I thought of trying a mini mash. The recipe was upping to a 17 litre batch and ingredients to match. That meant a lot more grain. Last time the recipe only had Crystal grains, which can’t mass by themselves. With advice from Chas I decided to include some Chocolate malt, which I believe can mash. So all 2kg of the grain went in to mash. Kilian was a champ and crushed the chocolate malt grain. The only thing I had was a mortar and pestal which meant some grain got crushed. Hope that doesn’t make much difference. The Crystal grain went into a grain bag and into the pot. The Chocolate grain got thrown into the bag then all was stirred in. 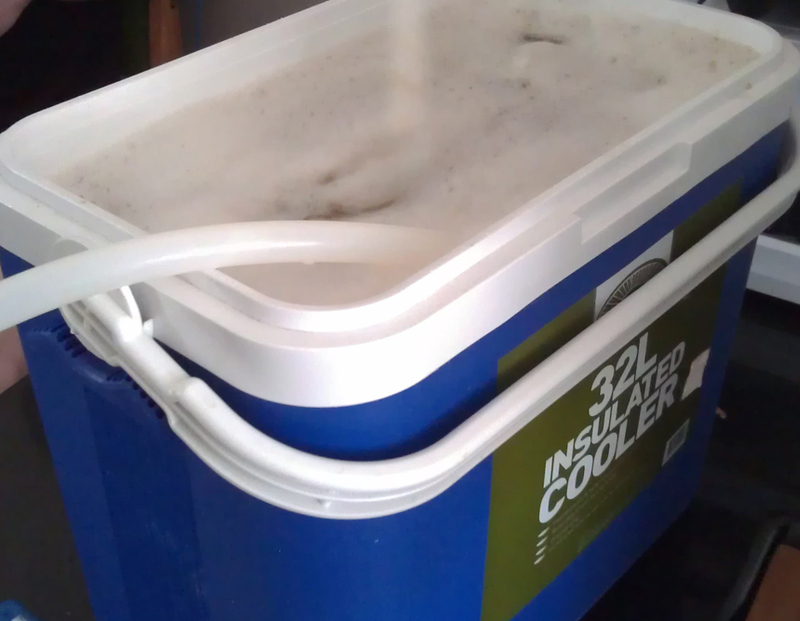 Mash was done at 68°C and had 5 litres of water. Wow, that grain soaked it all up and expanded like a balloon! Mash went for a full sixty mins. While waiting for the mash to finish we bottled the Hoppy Heart IPA. 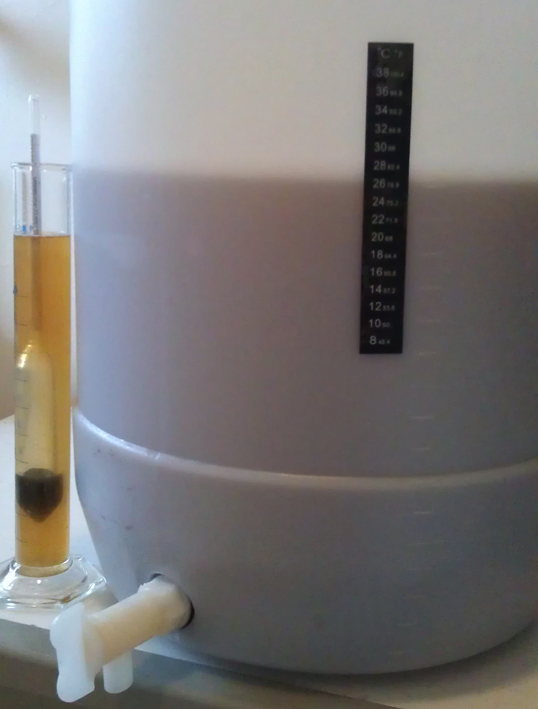 The final gravity came in at 1.019. With the carbonation drops it will be 6.4% alcohol. And before you ask, yes I will move to bulk priming soon. We opened the apple cider that Kilan brought. That was an interesting drink, and I mean that in all ways. We chilled it right down and was cold most of the time. First up it tasted like alcoholic orange juice, not like apple. Sort of super sweet and slightly tart. The smell was pretty bad, almost like something off. As it warmed up the cider became more like apple and more dry. Much better cold. 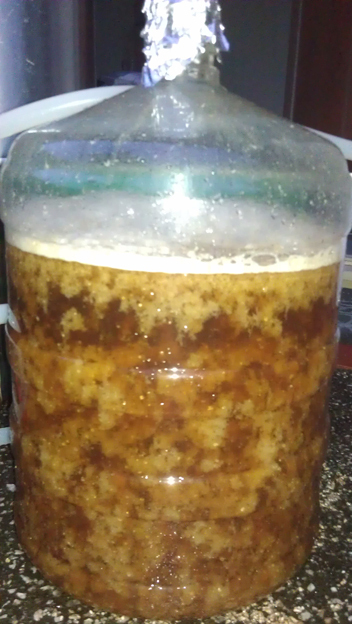 I think something might have gone wrong with the yeast and / or fermentation. Let’s see euchre same thing happens to my cider. Back to the brew, and mash was done. 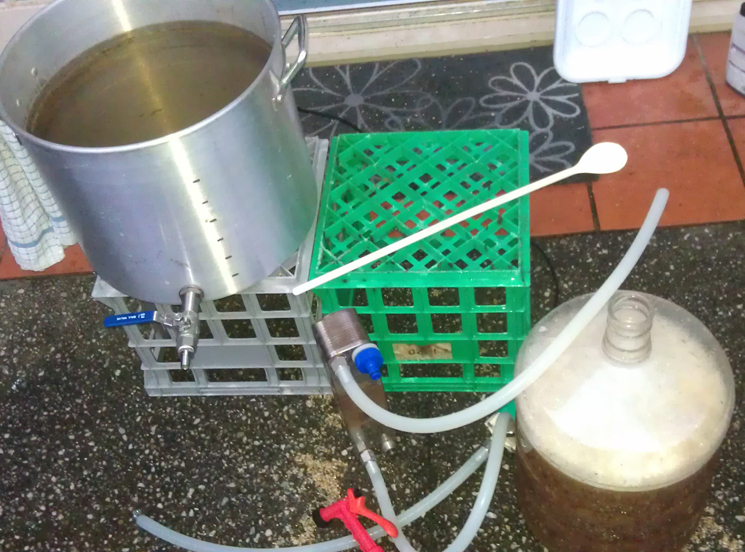 Only problem now was how to sparge the grain. And there was a huge amount. 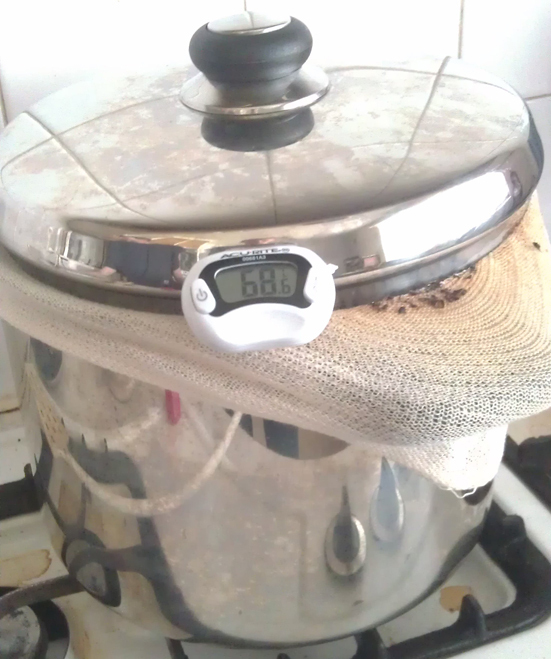 Was fortunate that the kettle we have at home has different temperature settings with the lowest being 75°C. So we used that and poured the water over the bag of grains. Each time we tried to press out as much liquid as possible, but we didn’t really have the right set up. 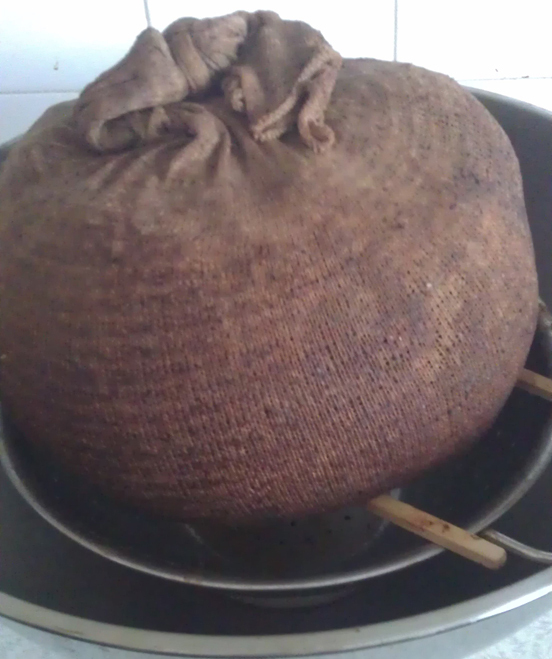 After a few kettle’s worth of water at said temperature there was a lot of volume for the boil. 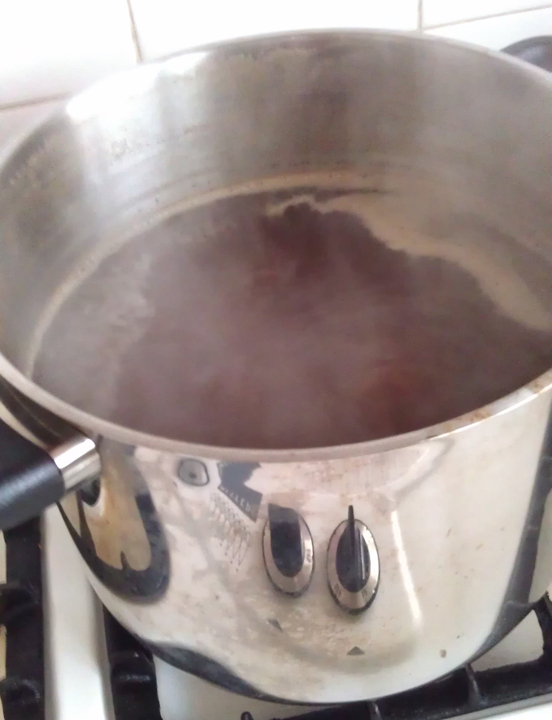 I would have liked to do more sparging, but the boil pot just wouldn’t hold it all. So onto the boil. Earlier I realised that I didn’t have the exact amount of hops to do what I wanted. There wasn’t as much Warrior and that was suppose to be the bittering. As a compromise I moved some of the Fuggles from aroma stage to taste. By moving them earlier it should add a bit more bitterness, and hopefully balance. Will have to wait and see. Once the boil started we re-hydrated the yeast. It’s the first time I’ve done this. It was pretty easy. The only problem is the water that was boiled so early on it cooled down too much. A quick zap in the microwave brought it back up to temperature. The yeast sat in the water while we dissolved the tea spoon of dry malt in half a glass of boiled water. Then waited half an hour before adding that in and gave it a mix. I held off on adding the dry malt for a bit. Have been getting advice not to add all malt at the start of boils and wanted to try it out. As a result we didn’t get a hot break, it just came to a boil. Bittering hops went in at start, then taste hops at thirty minutes with the first 800 grams of dry malt a five minutes later. Another fifteen minutes later added in the last 400 grams of dry malt. Five mins after that the aroma hops. Then only five more mins before flame out. Pot was transferred to an ice bath. Some ice cubes went directly into the wort, water previously boiled before frozen. A second bath for the pot. Then into the fermenter. Added a little more sparged grain liquid, that might not have been the best idea as I’m not sure if that could have lead to contamination. Too late now! 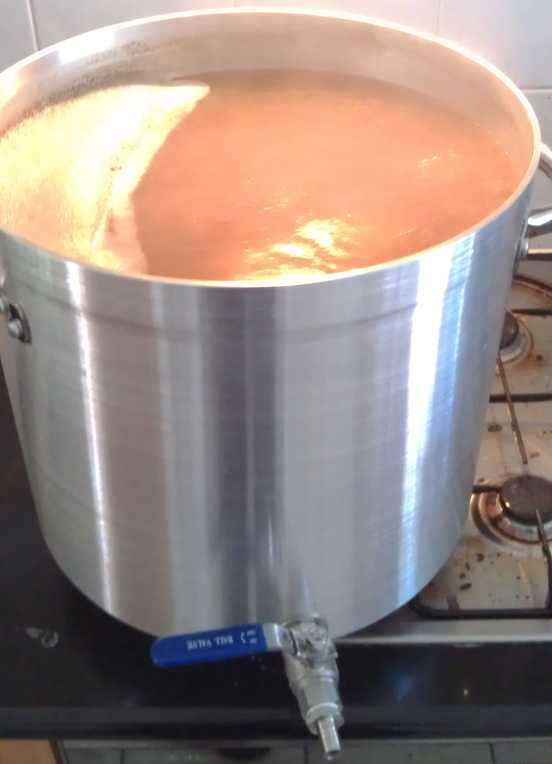 The liquid malt only went in at this stage, note that it wasn’t part of the boil. Not sure if that will make much difference. Let me know what you think with a comment below. The wort was still quite hot. That was even after adding about four litres of very cold water. Will need more ice if I’m going to do something this large and this method again. After a couple hours the temperature was down to something close to what I wanted. 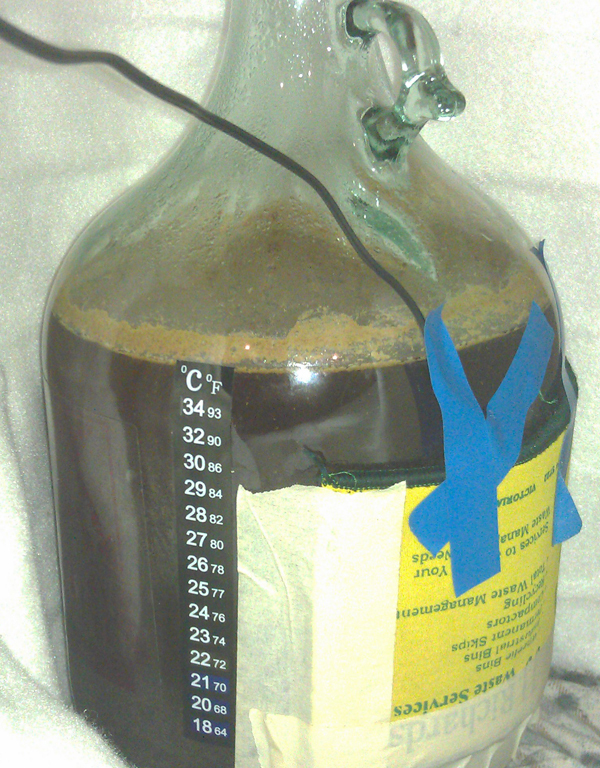 Yeast was pitched at about 25°C. I forgot to put the yeast nutrient in at the same time. So, went back an hour later and put in four heaped teaspoons and sealed back up. A bit of a strange brew. Some new techniques and processes. Some corrections from previous brews. 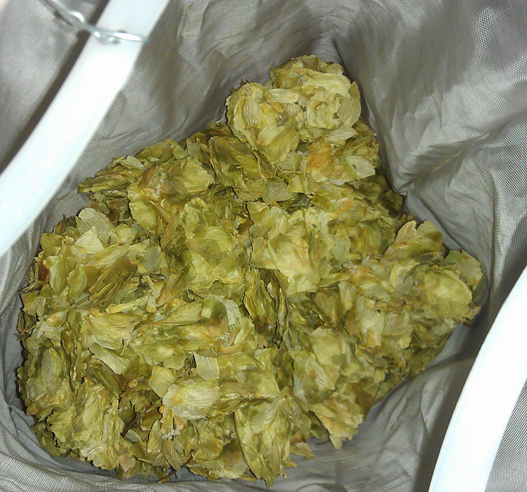 Some ingredients just thrown together, like hops and yeast. 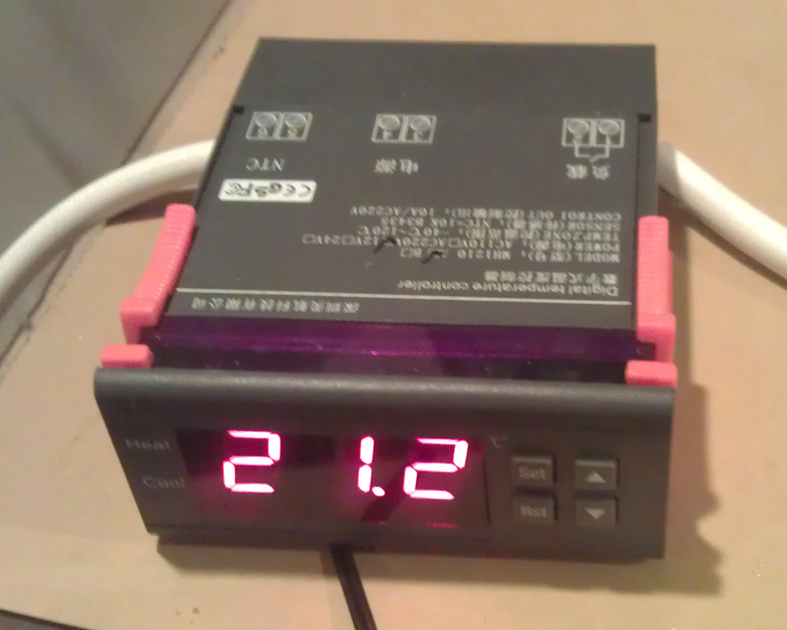 The final gravity came in at 1.071 which is pretty good given the calculated was only 0.002 higher than that. If fermentation can take it down to 1.025 that will mean about 6.5% alcohol before bottling. And this one will be bulk primed.